We know how much fun it is to be one of the good guys when playing Star Wars, but with so many awesome villains in the movies, it can also be fun pretending to be one of the baddies. Your little Star Wars fan will have a blast chasing after rebels as one of the coolest looking bad guys in the Empire with this official Deluxe Shadow Trooper Costume, from the Star Wars: Rogue One movie! So, what do these mysteriously menacing foot soldiers do when they go on a mission? We assume their name means that shadow troopers fight in the shadows, like spies or special ops soldiers, but their assignments are so secretive that it's impossible to tell exactly what they are up to! They might be tasked with tracking down and capturing rebel spies, or conducting dangerous recon missions, or for all we know, a "shadow" trooper might be responsible for holding a high ranking Imperial officer's umbrella on a sunny day. 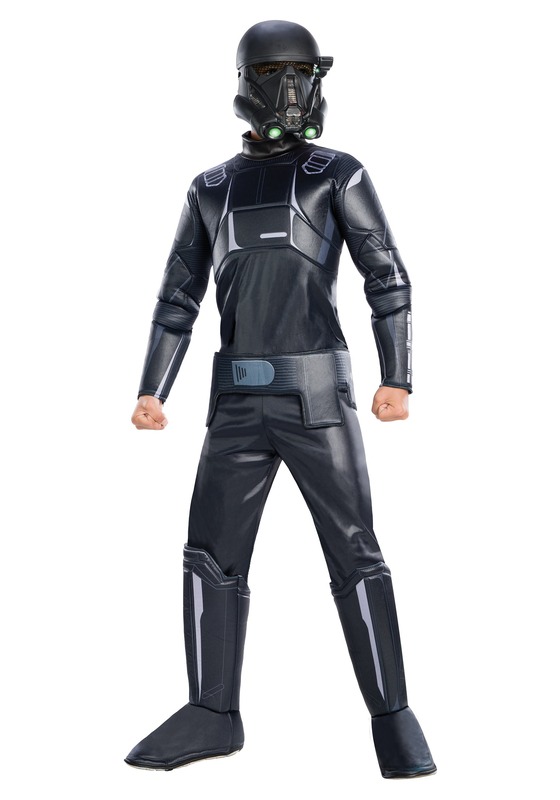 One thing we do know is that your kids will be prepared for any mission they get sent on in this deluxe costume. The bodysuit features stitched on foam armor plates, a foam belt and boot covers, so they'll look just like the elite troopers do on screen. It also comes with a full face mask molded to look like the fearsome helmets they wear into battle, with a mesh covered viewing slot for them to see out of, and breathing holes for extra comfort while pretending to go on long covert missions at costume parties. The good guys will surrender in no time once your little trooper tracks them down!